In open ponderosa woodland near Pinetop, Navajo Co., Arizona, USA. August 2009. FLOWERS: Pale to bright pink flowers have usually four petals tipped to one side and eight prominent stamens and four lobes to the stigma. LEAVES: Elyptic leaves have just a few teeth along the margins. ANNUAL: A number of herbaceous slender stems appear with summer growth between trees in woodlands. Most are about waist high when mature. Sometimes plants are PERENNIAL surviving year to year. 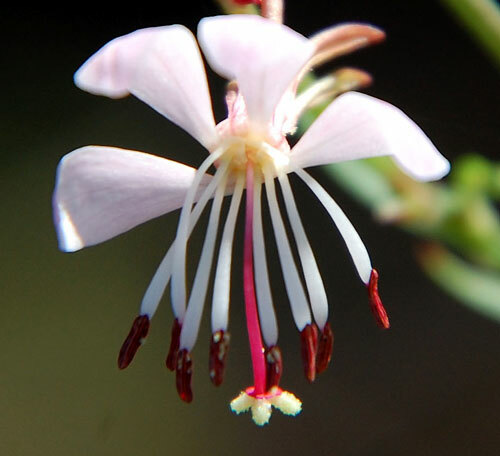 RANGE: In summer this plant can be found in ponderosa woodlands through much of Arizona. It also is found in drier, lower habitats. FRUIT: The fruit developes below the flower close to the stem. It is hard and breaks open uneasily. UNARMED. No spines or prickles.